HomeCommunity and PeopleSouth Coast Ski Show Returns!!! The South Coast Ski Show is back!!! For over a decade this show has brought all the major brands down to the south coast as well as ski and snowboard celebrities, well this year is going to be even bigger! 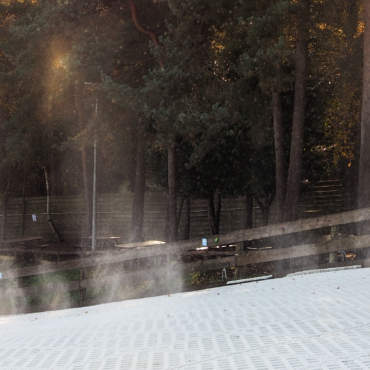 Spread out over 3 days, we’ve got literally hundreds of skis available to test on our newly resurfaced slope which is now sporting the NEW Proslope material. 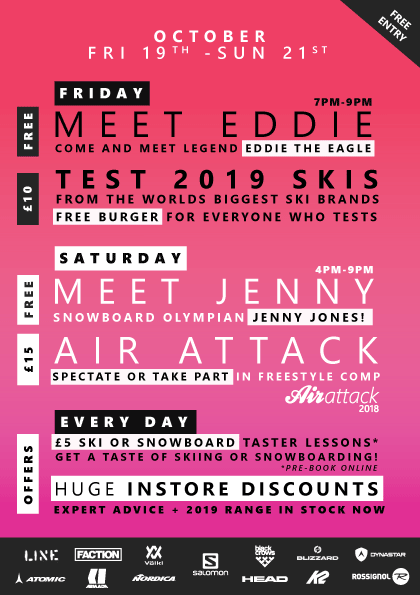 Plus the chance to meet two Olympic legends, ski jumper Eddie The Eagle, and Snowboard slopestyle medallist Jenny Jones! Friday the 19th will be a big one! Some of the biggest ski brands in the world are offering up their latest gear to be tested on our main slope. We recommend getting in early as there is always huge demand to be on next year’s kit! When you’re done testing, grab some hot BBQ food, whilst you watch Eddie The Eagle shred the slopes himself! During the day we’ll be running the first day of taster session where you can try skiing and snowboarding for £5 including all the kit you need. Saturday sees more of the taster sessions and live music running until 4pm. Then the freestyle comp takes over the main slope, with great features all over the slope and Olympic Legend Jenny Jones in the judges box! The skiers and boarders will be competing for prizes from Salomon, Snowtrax, and Picture. Live DJ’s will bring the soundtrack and the competitors will be judged on technique, difficulty, and style of each manoeuvre! If you’re not riding, then we definitely recommend heading to the main deck for some waffles while you watch! Sunday is the last day of taster sessions so it’s definitely worth booking early. The slope will be open all day and the afternoon and evening will see more live music and tasty waffles being made on the deck above main slope. The South Coast Ski show is always a great time to come and experience all things Alpine. Test all the 2019 ski kit on our main slope. Chance to meet Eddie The Eagle. Ski and Snowboard taster sessions all day. Prizes from Salomon and Picture.